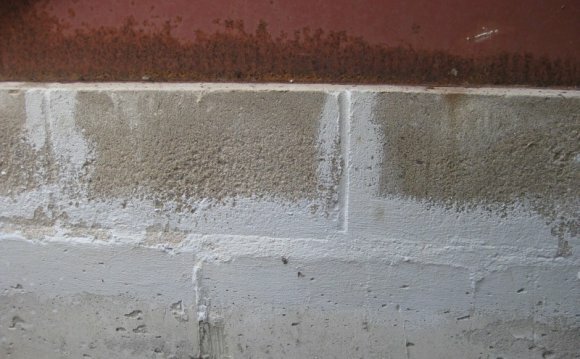 Copper water lines under a slab can simply wear out and begin to leak. There are several signs that point to a slab leak. The first is the presence of water or damp spots on your floor. Leaking hot water lines can create warm spots on your floor. Walking around inside your home barefooted will expose the location of a leaking hot water line. The second giveaway alerting you that your water lines are leaking is the sound of rushing water underneath your floor. Finally, since a leaking water line runs continuously, you might receive a significantly higher water bill than you are accustomed to. Sewer lines pose a different problem. Most leaks in a sewer line go undetected until there are visible signs of foundation damage. In areas with expansive soil, a leaking sewer line can cause heaving, which is when the slab swells enough to lift the building. Another sign indicating a potential sewer line leak is a dome or raised section in the floor. Hard to find slab leaks require the use of specialized listening devices. After the water is turned off, air is pumped into the lines to force out remaining water. This allows the plumber to listen for escaping air from the damaged pipe. Once the leak is identified, the plumber can ascertain the best way to go about repairing it. Sometimes it is better to re-plumb the entire house rather than waste money repairing old plumbing. This is recommended when a home is plumbed with old galvanized piping. Repairing those old pipes is often not cost effective because they are extremely hard to fix and will continue to spring leaks as they age. After locating the slab leak, you have to gain access to it so that you can repair it. This requires breaking a hole in the slab with a jackhammer. Finished flooring is removed to expose the concrete slab, with ceramic tile being the exception. Opening a slab creates a lot of dust. You should cover or remove any valuables or furniture beforehand. Once the hole is cut, the dirt is removed to expose the leaking pipes. The most common type of pipe used for water lines under a slab foundation is copper tubing. As copper pipes age, they are prone to wearing thin and springing a leak. To repair a copper pipe you must cut the damaged section of pipe with a hacksaw, reciprocating saw or tubing cutter and remove it. A new piece of tubing combined with copper couplings is soldered into place. Fixing a leaking sewer line may require the services of a plumber because of the types of pipes used for sewer lines and health-related issues involving exposure to human waste. Depending on the age of the home, the pipe may be cast iron, clay or PVC. Although special rubber couplings are ideal for connecting different types of pipes they are not recommended for use underneath concrete slabs. The rubber boots can deteriorate over time, especially when they are used outdoors.